The Boca Raton Symphonia and its Allegro Society will present a new “Saturday Night Classics” Concert conducted by Guest Conductor David Commanday that showcases the works of composers Mozart, Mendelssohn and Copland on Saturday, April 9, 2011 at 8 p.m. at the Roberts Theater on the campus of Saint Andrew’s School at 3900 Jog Road. In addition to performing Mozart’s Piano Concerto No. 23 in A major, K. 488 and Symphony No.4 “Italian” by Mendelssohn, the full symphonic orchestra will play Music For Movies by Copland. A champagne and dessert reception will follow. “Born in response to requests from the many classical music lovers and supporters of the Boca Raton Symphonia in South Florida who have expressed interest in a Saturday Night Classical Concert Series, the Allegro Society embraced the opportunity and took the lead to grow the Symphonia’s reach and accessibility in the region,” noted BRS and Allegro Board Member Mimi Sadler who is co-chairing the inaugural event. “Classic music lovers are in for a real treat; Conductor Commanday is known for dynamic performances, innovative programming, and an appealing connection with audience and community,” added Event Co-Chair Susan Courey. “The ultimate goal of the upcoming Saturday night performance is to establish a special supplemental “Saturday Night Classics” Concert Series to expand the BRS’s popular Sunday afternoon Connoisseur Concert Series throughout the season to accommodate the varying schedules of so many in the community. David Commanday is the founding Artistic Director and Conductor of the innovative Heartland Festival Orchestra. He has conducted orchestras around the world, including the National Symphony, Israel Philharmonic, American Symphony, Louisville Orchestra, Belgian Radio Orchestra, Vienna Pro Arte Orchestra, and the Seattle, Atlanta, and Richmond Symphonies. In his position as Music Director of the Peoria Symphony Orchestra for ten seasons, he is credited for bringing the PSO to “a high-point in its 103-year history”. Now Artistic Director of the New Jersey Youth Symphony, Commanday continues a life-long commitment to training young musicians. He has held faculty positions and conducted at Harvard University, Boston University, MIT, Virginia Commonwealth University, and Montclair State University. He is active as teaching and conducting clinician, conducting All-State and regional student orchestras around the country. In addition he continues to play and perform as cellist, appearing with such artists as Yo-Yo Ma, Bobby McFerrin, and Antonio Pompa-Baldi. His recent guest-conducting schedule included the South Carolina Philharmonic, Flagstaff Symphony, Eastern Connecticut Symphony, the Joffrey Ballet, and Ballet West. Recognized by critics as a gem of an orchestra that is now in its sixth year, the world-class BRS performs and makes accessible classical music through concert performances and educational outreach programs featuring nationally and internationally acclaimed conductors and soloists. 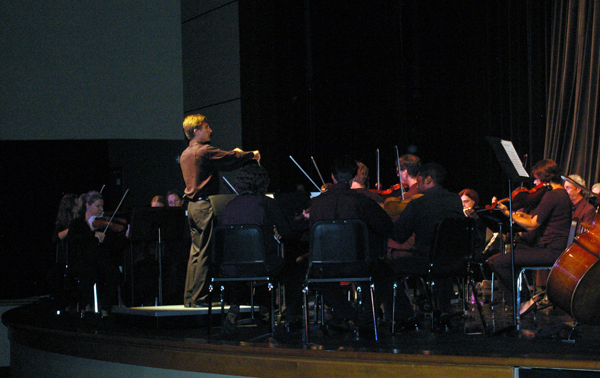 While based in South Florida, the orchestra members who make up the symphonic orchestra have performed with such conductors as Leonard Bernstein and Seiji Ozawa and orchestras worldwide, including Moscow Chamber Orchestra, Israel Philharmonic, Boston Symphony, Milwaukee Symphony Orchestra, IRIS Orchestra, and Santa Fe Opera. The current 2010-2011Connoisseur Concert Series features the orchestra’s new internationally-renowned Principal Conductor and Piano Soloist Philippe Entremont, one of the most recorded artists of all time who has served as music director of Vienna Chamber Orchestra, Israel Chamber Orchestra, New Orleans Philharmonic, and the Denver Symphony. The BRS Allegro Society is a women’s volunteer auxiliary group whose mission is to promote and broaden the BRS’s musical and cultural presence in South Florida to expand the Symphonia’s audience, visibility, and appeal. Since its inception a year ago, the Allegro Society has assisted the Boca Raton Symphonia attain record subscriptions for the current 2010-2011 Connoisseur Concert Series. Tickets to the BRS “Saturday Night Classics” Concert are $50 per person. For information about the Boca Raton Symphonia, joining its Allegro Society, and to purchase tickets call (561) 376-3848 or visit www.bocasymphonia.org.